The Southern screamer or Crested screamer (Chauna torquata Oken 1816) is a strange bird belonging to the order of the Anseriforms (Anseriformes), even if it does not have the main anatomical characteristics typical to the members of this order, to the family of the Anhimids (Anhimidae), to the genus Chauna, which includes 2 of the three species belonging to such family, and to the species Chauna torquata . The name of the genus “chauna” comes from the Greek “khaunos” and means “spongy, porous” and refers to the cells or air sacs present in the subcutis of this species (physiological pneumoderm). “When any part of the skin is touched with the hand, you could hear a crackling sound” (drawn from Latham’s observations, 1785). The name of the species comes from the Latin “torques-torquatus” = bearer of collar, with reference to the showy ruff of this bird. The species is amply distributed in a vast central-southern belt of South America: through the pampas of northern Argentina, in Uruguay, in southern Brazil and in the subtropical parts of Bolivia and Paraguay. The preferred habitats of the southern screamers are the tropical or subtropical lakes, the lagoons, the swamps, the flooded fields, the meadows and the llanos. In winter, the species becomes rather nomadic and vagrant being engaged in irregular peregrinations looking for food. The southern screamer is the most gregarious of the three species of screamers; usually it gathers in huge flocks, in the zones with shallow waters, mainly for spending the night. Outside of the reproductive season,(and also in during this time for the specimens not involved in the reproduction), the southern screamers may gather in flocks of even thousands of individuals for grazing peacefully together. These groups can feed also on open prairies and cultivated fields and in some countries, in particular in Argentina, they share the pastures with tamed birds, sheep and bovines. These habits lead sometimes the birds to be in conflict with the countrymen due to the erroneous belief that they are in competition with the cattle (especially with the herd of sheep), and that they carry diseases to the animals and cause damage to the crops. It is a bird of discrete size, with a weight of 4-5 kg. They are fairly tall birds, from 80 cm up to 1 m, clumsy on their huge, disproportionate, pink-reddish, legs, have a body and a size reminding those of a big goose and seem “assembled” with quite different parts of different types of birds. The fingers, quite long are 4 : 3 bent forward and 1 bent back; they are all arranged on the same level granting stability and fair distribution of weight on the swampy surfaced and covered by vegetation, extremely giving in, frequented by these species. It has a slow and strutting gait which appears as very dignified and noble. Even if the legs are not webbed, these birds are able to swim and love quite a lot to bathe getting to soak completely the plumage, so much to be obliged to then dry up under the sun in order to fly again. The screamers, as is typical in the flying birds, have hollow bones but their skeleton is extraordinarily pneumatic having practically all bones hollow, among which the spine, the distal bones of the wings and the phalanges of the fingers. There skeleton is consequently extraordinarily light. Another characteristic of this family of birds, which originates the name of the genus of two of the three species, is the presence of air sacs under the skin (pneumoderm), extending up to the legs and which give the flesh a spongy and crackling look at the touch. These air sacs may be rapidly contracted so much that one can hear, when close, if the skin of the bird is crushed, particular crackling sounds, like “popping balloons”. The pneumatic bones, along with the pneudoderm, render the screamers much floating on the water; the fact of floating is already present in the chicks. The species is characterized by short nuchal crests formed by pointed feathers and which ornate the head generating one of the common names of this species (crested screamer). The livery is mainly grey slate of grey shaded of brown. The dorsal parts are more dark grey with brown hues. Head, neck and abdomen are of a paler and silvery grey with the chest and the higher abdomen has a slightly scaly appearance. The lower abdomen, the peri-cloacal zone and the underwing are whitish. 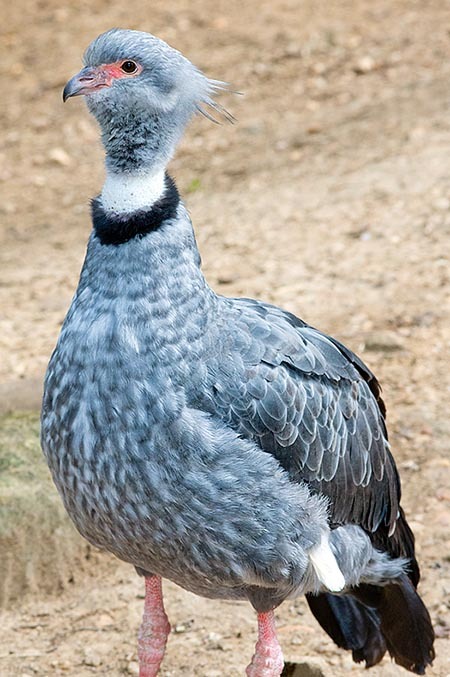 The neck presents a characteristic ruff of black feathers having a soft and velvety look; over this, before the head, is present a sort of second white ring formed by short down and glabrous skin creating a kind of narrowing between head and neck. This ruff/white portion is thinner than the underlying black ring, and may go on in a little evident small portion of pink skin, not always visible. When the bird, in fact, keeps the head slightly recessed, the white ruff is not visible. The base of the chinstrap, with its slightly fluffy forming cheeks with a funny look, is slightly tinged with dark. The wings are ample and powerful; the primary remiges, when flying, are carried well open and remind the wings of the vultures. The rectrices have the same colour as the remiges. 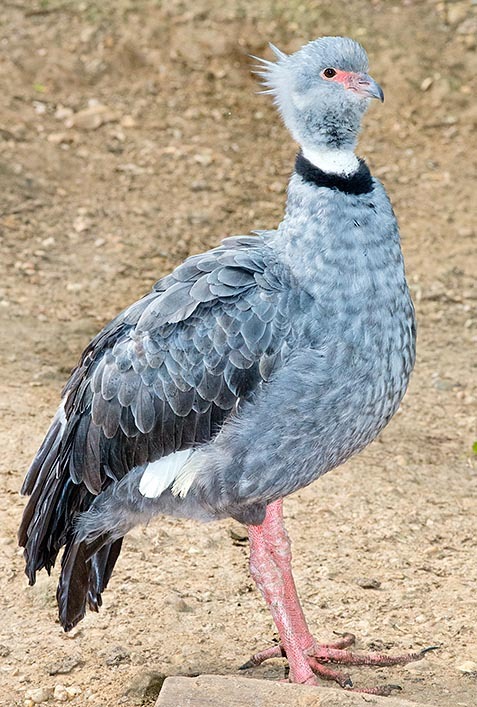 The southern screamer had two forms of colouration: one is decidedly darker than the other (the above described form is the paler one). The beak is very particular, short, robust and decidedly hooked: it reminds quite a lot the beaks of the galliforms and of the raptors as it seems a mix between the two typologies. The beak if grey horn with the base more or less amply shaded of fleshy-pink. From the beak prolongs a portion of bare skin, bright pink-red, which surrounds, not too amply, the eye. The iris is strong brown. The sexes are similar and, even if the females tend to be slightly smaller then their own males, they also are equipped with deadly carpal spurs, long, slightly bent and perforating. Also other species of birds can have single spurs, but the screamers have two of them on each wing: both originate from a bony base physiologically protruding from the carpus/metacarpus. The proximal spur, bigger, can be even more than 5 centimetres long. The superficial corneous layers of these spurs are renewed periodically as they can allow the regrowth of uprooted or partially broken spurs. Such unbelievable spurs, evident with closed wings as well as during the flight, render the screamers as potentially dangerous birds also because the strength of the wings with which they can deliver powerful blows potentiate the offensive action of this sort of daggers. Obviously, the screamers are more aggressive during the reproductive season when they are busy in defending the territory, the companions, the nest and the chicks. Uprooted corneous claddings of spurs, have been found in the chest of some seized screamers; unmistakable sign of bloody battles. By sure, during these intra-specific fights, is possible some case of fatal conclusion. It is the most numerous, and very abundant in some regions, species among the three species of extant screamers. However, the southern screamer is also the mostly hunted species (even if the spongy flesh is considered unpleasant) and most persecuted as most of the population lives in geographic areas densely populated. Also the overhead power lines may be dangerous for the birds that easily collide with the electrical cables. The local names given to the species are “Chajà” or “Tocha”, they are onomatopoeic terms referring to the vocalizations emitted by these birds characterized by the fact of being strong, harsh, hard and blaring. Often the pairs keep in vocal touch also when flying with the male emitting low calls and the female answering with higher screams. With their cries, the screamers can alert also animals of other species and the domestic livestock thus acting as real guard animals. They may emit, at close range, also hushed guttural verses as threatening signals. Slight crackling cries and soundless beak beats are often done by the members of the pairs in order to reinforce their ties. If menaced by possible foes, they can try to intimidate them by beating the beak and emitting hissing whistles. The southern screamers often do ample ascending flights, up to remarkable heights, moving in circles, even for hours. When flying in such way, they have a behaviour which recalls and makes them mistaken with vultures and storks. These birds can peacefully perch on the trees and remain roosting even for hours. 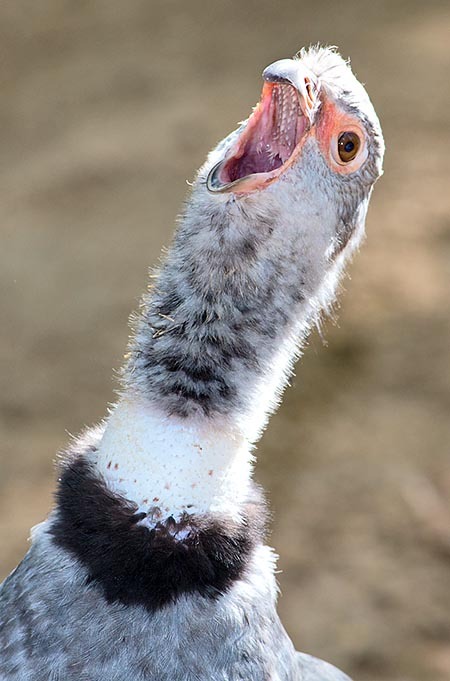 The screamers are mainly herbivorous birds with diurnal habits, the mainly eat succulent herbs, leaves, seeds, flowers and roots of many varieties of aquatic and swamp plants. Often these animals nourish of the emerging fleshy part or semi-submerged of the plants by walking through the aquatic vegetation itself; less frequently, they dig in the mud in shallow waters. The screamers complete their diet feeding of invertebrates especially during the breeding of their progeny; the chicks catch insects even autonomously. Most of the reproductions take place during the austral spring; the spawning is concentrated in the months of October and November. The screamers make rudimental courting but the pair ties are durable and are continuously consolidated by duet vocalizations. The reproductive pairs isolate, looking for a suitable reproductive territory, by late winter-early spring; in this period possible conspecifics are not any more tolerated and are actively sent away. The nests are built by both members of the pair; the material used is of vegetal origin (grass, reeds and sicks) and at times the nests resemble those realized by the Maguari stork (Ciconia maguari). The material for building the nests usually collected in the immediate proximities of the same and the area around the nest is cleaned up from the vegetation which is torn and thrown behind its back. Generally, the nests are done in shallow waters; they may float, be anchored and may be very bulky and even tens of cm tall. The copula takes place on the ground or on the nest. The hatching is formed normally by 3-6 eggs (they are white-dirty and become yellowish during the brooding) that are hatched for about 40-45 days. The chicks are precocious and often do not remain long in the nest. The parents are very protective and lead with attention the chicks who are immediately able to enter the water where they can float. The chicks look very tender, are roundish, yellow with the head and the backs slightly more golden and paler abdominal parts. The chicks also while growing recall the ducklings becoming delicious round and chubby chicks with small little wings, as the remiges grow later on. The young can return to the nest, for the night, for long periods and are warmed up under the wings of the parents for long time. The chicks, when just born, have the uropygium functioning poorly and the parents can strew the chicks with the secretion of their own uropygia. The young spend a lot of time in the water and hidden into the vegetation till when they do get the necessary strength for learning to ably run. Even if the chicks can take the food directly from the surrounding habitat, the parents give them choice morsels which are left falling in front of the chicks or taken by them from beak to beak. The young acquire the capacity of flying around the 8-10 weeks of age and the complete independence by around the 12-14 weeks of life. The young have duller colourations and doe not have the wing spurs (or they are just hinted) and also the portion of reddish periocular skin. 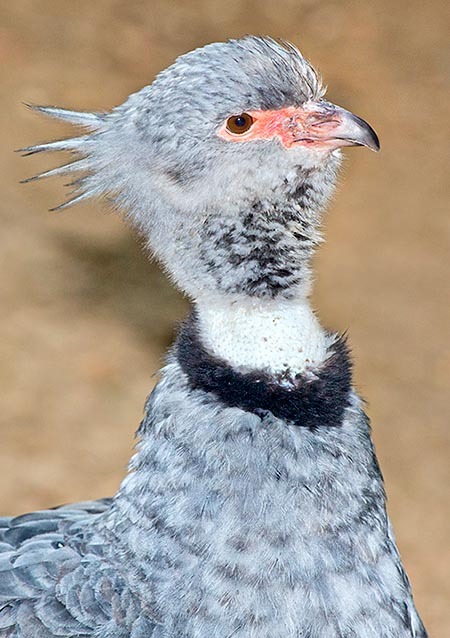 The southern screamers are easy to tame and are wonderful animals to breed, capable to get meekly used to the cares of the breeder and are source of very nice observations. It is almost touching to see the delicacy with which the members of the pair exchange sensitive effusions, smoothing and “sifting” each other (in particular, the plumage of the head), by means of mutual grooming done with the beak. The same behaviours are reserved to the own chicks.